Properties in Whakatiwai average 4.5 out of 5 stars. Property 3: Sea Urchin Cottage offers a tranquil and picturesque escape from the city. 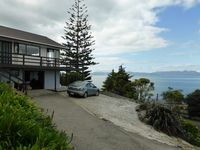 Property 5: Stunning beachfront location - studio situated in private, quiet garden setting. Peaceful and close to the birds at Miranda!